One of the shared components of the OPNsense framework is the menu system, which is wrapped in a single class and part of the base model. The only responsibility of the menu system is to create a tree like structure to represent the menu and being able to keep track of the mapping between a location and the hierarchy of the menu system. To keep things clean and understandable, the menu system doesn’t know anything about users or authorisation. Currently the main focus for the menu system is to support the legacy code, so we will be able to reimplement the menu in both legacy and new code. 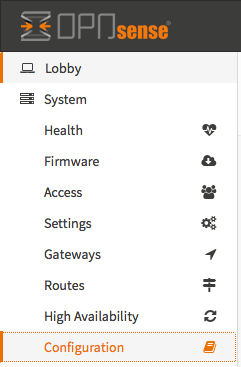 Our base UI controller (\OPNsense\Base\ControllerBase) implements the menu system for further use. The current version only implements a static menu defined by one XML file (models/OPNsense/Base/Menu/Menu.xml), but extending with additional XML files is already supported in the component for future use. cssClass, style attributes for the frontend system.